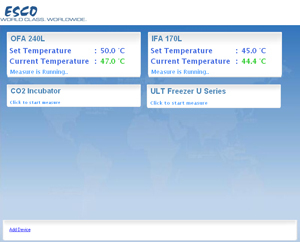 World sourced components permit us to test and integrate the most innovative solutions to our products. What we learn in one part of the world we can apply to another and, eventually, to your laboratory. As a result, Esco products represent the most pervasive applications of controlled environment laboratory and cleanroom equipment solutions in the industry. In order to create a high performance, low flow fume hood, changes were made to the design of Esco fume hoods to increase overall aerodynamics. 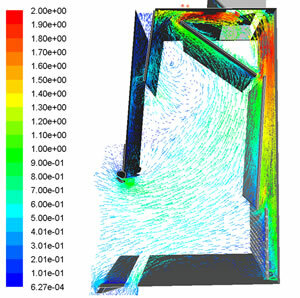 Computational fluid dynamics was applied to analyze problems that involve fluid flows. The baffle orientation, sash airfoil, armrest airfoil, exhaust collar, and bypass designs were improved to become aerodynamic. These were implemented on the Acela Fume Hood with the objective of increasing fume hood containment performance and energy savings. The cabinet was then tested to comply with ASHRAE 110:1995 and EN 14175:2003 standards. Esco has developed the StableFlow microprocessor speed controller to maintain steady motor/blower speed despite building voltage fluctuations, thereby assuring constant face velocity and downflow for optimum safety, containment and protection. Many Esco biological safety cabinets incorporate a unique Dynamic Chamber Plenum with angled downflow orientation to optimize airflow uniformity over the work surface, and to simplify filter maintenance and certification. 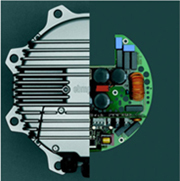 The Dynamic Chamber Plenum underscores Esco's attention to details in component application through intelligent design. Esco Infinity and Airstream Duo biological safety cabinets employ a double blower system to provide the maximum possible level of safety. Esco cabinets use supply and exhaust filters that provide >99.999% typical efficiency for particle sizes of 0.1 to 0.3 microns. Filters meet the IEST-RP-CC001.3 recommended practice for ULPA performance (USA), and EN 1822 for H14 performance (EU). These provide better filtration capability than conventional H13 HEPA filters that have a typical efficiency of >99.99% for 0.3 micron particles. For some products, however, conventional HEPA filters are used depending on the application and local preferences of geospecific markets. 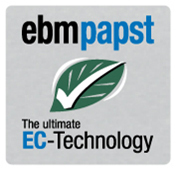 Esco new generation cabinets use high performance, German made ebm-papst® permanently lubricated, centrifugal ECM blowers with external rotor designs. Selected for energy efficiency, compact design, and flat profile, completely integrated exhaust blower assemblies optimize motor cooling with unified rotating parts and overall component balance for smooth, quiet, vibration-free operation. Weight is equally distributed to all bearings to extend bearing life, transfer heat and maximize speed control. Many Esco products are used in processes that require long hours seated or standing in laboratories and production facilities. As a result of internal and commissioned research in human interface, intuitive control design, ergonomics and workplace physiology, Esco has adapted product designs to improve comfort, visibility and productivity. Product design attributes include sloped front access to improve interior reach, curved armrests, high-efficiency lighting and optional adjustable work surfaces. Control systems have large, easy-to-read digital displays, touchpad controls with tactile feedback, and logically arranged functions with on-board tutorials if needed. Esco has developed the Sentinel suite of microprocessor-based control and alarm systems to supervise cabinet functions throughout the product line. Sentinel controllers range from simple to sophisticated. Setpoints and other applications are user-activated through touch-pad programming. Digital value outputs for remote alarm, monitoring and compliance are featured in the latest generation Sentinel controllers, along with downloadable software updates and graphic data expression functions. To assure safe delivery to destinations throughout worldwide markets, Esco has developed Esco EnRoute™, an internal quality and logistics program designed to assure timely shipment and to eliminate damage during transit. Because most Esco products are destined for international sales, our administrative processes and documentation have evolved to include efficient, environmentally-friendly and well-designed packaging, prompt order confirmation, shipping advisories and status notifications to our global distribution system. Esco's EnRoute packaging and shipping program includes destructive testing and analysis for optimum packaging to mitigate shipping damage, claims and installation problems before they occur. More than 95% of Esco products are shipped to international locations beyond Singapore, validating Esco's position as one of the industry's leading exporters of high-quality laboratory products. Energy consumption and operating costs are critical factors in Esco new productdesigns and manufacturing engineering improvements. Energy management considerations range from component evaluation and selection to cabinet operation and airflow. Because many Esco products exhaust treated or filtered air to the environment, improvements in exhaust mitigation to relieve facility heating and air conditioning systems is a top R&D priority. Esco innovations in energy management and environmental impact range beyond the laboratory, including product technical advances such as intelligent selection of packaging and crating materials, reducing manufacturing utility consumption and aggregation of destination shipping bundles to lower shipping costs and save fuel. Esco biological safety cabinets are designed to operate within a performance envelope to maintain protection for personnel, product and the environment. Airflow parameters used to frame the performance envelope including Inflow Velocity and Downflow Velocity. The range between high and low Inflow, and high and low Downflow, together with the fluid dynamics achieved through sophisticated cabinet design, proportionally sized capture slots, and uniform laminar airflow, combine to deliver a complete containment and safety solution expected of a professional biological safety cabinet. Esco's range of temperature-controlled equipment are compatible with the Esco Voyager, a PC-based software package developed for remote monitoring, datalogging, and programming / device configuration, providing maximum safeguarding of samples. Voyager allows users to monitor and configure devices remotely and be alerted when a device exceeds user-defined parameter limits. Up to 16 combined Esco devices can be interfaced to a single PC.